A Norwegian firm has signed a deal to buy a south of Scotland fish hatchery. It will see salmon breeder AquaGen take over the Scottish Sea Farms site at Holywood near Dumfries. 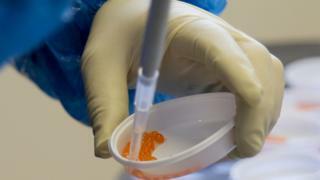 The company said the move would allow it to offer a "reliable supply of eggs" to salmon farmers. Chief executive Nina Santi said it was planning a "series of upgrades" to existing facilities at the hatchery and hoped to produce up to 50 million eggs a year. Rural Economy Secretary Fergus Ewing said the investment showed the company's confidence in the sector in Scotland. Scottish Sea Farms' head of fish health Ralph Bickerdike added: "This is a hugely promising development for Scotland's salmon farmers, bringing world-leading breeding expertise and technologies to bear on home-grown broodstock so that their offspring can be adapted to specifically suit the Scottish marine environment. "This, in turn, will bring a whole host of further improvements in terms of fish welfare and product quality."